The World League continues to innovate and inspire, providing opportunities for countries to participate at the highest level. Since 2012, the competition has seen tremendous growth having expanded from 12 teams three years ago, to 18 in 2013 and 28 in 2014. In 2015, Egypt, Kazakhstan, Greece and Montenegro have been added to Group 3, taking the competition to 32 participants. The 2015 World League will take place from May 16 to July 19, with Intercontinental Round action from May 16 to July 5. The Group 3 Finals will be hosted by Slovakia from July 3-5. They will be followed by the Group 2 Finals in Bulgaria from July 10-12 and the Group 1 Finals in Rio de Janeiro, Brazil from July 14-19, which will serve as a test event for the volleyball tournament at the 2016 Olympic Games in the Brazilian city. During the Intercontinental Round, Pools A to E will play according to a home and away system. Pools A and B make up Group 1 with six teams to play the Group 1 Finals for the World League title. Pool A features two of the most successful countries in the 25-year history of the World League with world No. 1 and nine-time champions Brazil along with eight-time winners Italy, Serbia and Australia, who replace Bulgaria after winning Group 2 in 2014. In Pool B are 2013 champions Russia, 2012 champions Poland, 2012 silver medalists USA, and rapidly improving Iran. The second group will feature 12 teams split into pools C, D and E. Four teams - the host country - Bulgaria - and the winners of the three pools - will qualify for the Group 2 Finals. The winner of Group 2 will qualify for the Finals of Group 1. Promotion and relegation from the group will also be at stake. In Group 3, 12 teams will be split into three pools F, G and H. Teams involved will play in a round robin system, with one host country per tournament. Two rounds will feature six matches per team. Four teams – host country Slovakia and the winners of the three pools - will participate in the Finals. The following teams are in Group 1: Australia, Brazil, Italy, Iran, Poland, Russia, Serbia, USA. Group 2 includes: Argentina, Belgium, Bulgaria, Canada, Czech Republic, Cuba, Finland, France, Japan, Korea, Netherlands, Portugal. Group 3 includes: China, Egypt, Greece, Kazakhstan, Mexico, Montenegro, Puerto Rico, Slovakia, Spain, Tunisia, Turkey, Venezuela. 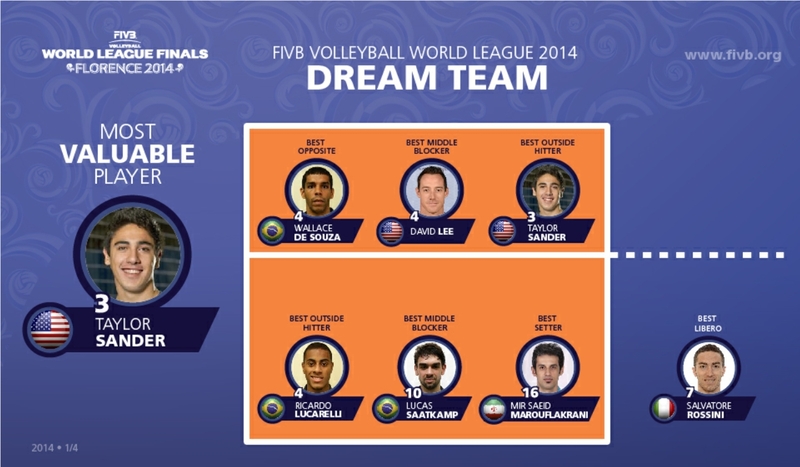 In 2014, the United States, led by 1st Best Outside Spiker and Most Valuable Player Taylor Sander, defeated world No. 1 Brazil in four sets 3-1 (31-29, 21-25, 25-20, 25-23) to claim their second World League title in front of 9,000 fans at the Nelson Mandela Forum in Florence, Italy. Their first World League title came in 2008. USA now have two golds (2014, 2008) from three World League finals and five medals overall (two gold, one silver and two bronze). Brazil claimed their fifth silver medal and 18th overall (nine gold, five silver and four bronze). Brazil is the most successful nation in the World League.